Many people overdo it with the drinking on St. Patrick's Day, but it's not always Guinness or Jameson that gets them into trouble. Sometimes it's the Shamrock Shake, McDonald's uniquely green and often elusive seasonal treat. Here’s the skinny on the 660-calorie indulgence. 1. IT WASN'T ALWAYS KNOWN AS THE SHAMROCK SHAKE. The original name of the cult classic milkshake was slightly less alliterative. It was called the St. Patrick’s Day Green Milkshake. Catchy, no? 2. IT'S A CHARITABLE ENDEAVOR. What does the Shamrock Shake have to do with the Ronald McDonald House and the Philadelphia Eagles? Everything, according to the fast food giant. When Eagles tight end Fred Hill’s daughter was being treated for leukemia in 1974, Fred and his wife spent a lot of time in waiting rooms and noticed many other emotionally depleted families doing the same. He thought it would be healthier for families if they had a place to call home while their children were being treated, so he used his football connections to get in touch with a local advertising agency that did work for Mickey D’s. They agreed to give profits from the Shamrock Shake toward a home near the Children’s Hospital in Philadelphia, which ended up becoming the first-ever Ronald McDonald House. 3. UNCLE O'GRIMACEY USED TO BE ITS AMBASSADOR. 4. NO RESTAURANT IS REQUIRED TO CARRY IT. In 2012, it was announced that, for the first time, the Shamrock Shake would be available in all McDonald's nationwide—but not all restaurants have to carry them. Regional managers decide whether their stores will carry the shakes each year. 5. JIMMY FALLON ONCE DEPLETED A NEW YORK CITY RESTAURANT'S ENTIRE SHAMROCK SHAKE SUPPLY. If you’re a New Yorker and you didn’t get a much-craved Shamrock Shake in 2011, it’s probably Jimmy Fallon’s fault. When he caught wind that a Union Square Mickey D's had the elusive dessert, he totally cleaned them out—purchasing more than 100 shakes for his audience. New Yorkers were not pleased with Mr. Fallon. Despite the smashing success of the shake, the Shamrock Sundae was a dismal failure. Introduced in 1980, it was discontinued after just a year. Apparently people prefer their unnaturally green desserts in shake form as opposed to scoop form. 7. THERE HAVE BEEN MANY SUPER-SIZED VERSIONS. Behold, the biggest Shamrock Shake ever made. For a few years, a giant shake was poured into the Chicago River to help contribute to the green hue it’s dyed every year. A donation was also made to the Ronald McDonald House. 8. THERE'S A WEBSITE DEDICATED TO HELPING YOU TRACK ONE DOWN. Are you one of those unfortunate souls who has to hunt the shake down every year? There are others like you, and they can help—at ShamrockShake.com, other fans will tell you the exact location and time where they located it. 9. YOU CAN MAKE YOUR OWN AT HOME. If you still can’t find a shake, you have one other option: make your own. 10. THEY NOW COME WITH A SPECIAL STRAW. 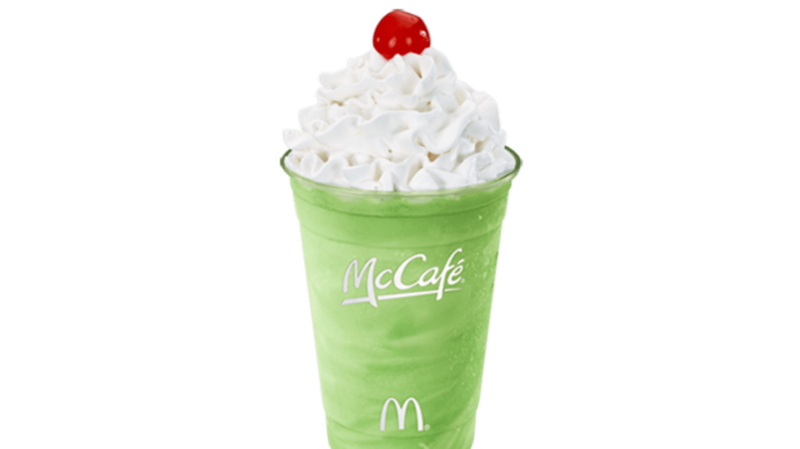 Last month, McDonald's unveiled an amazing innovation for Shamrock Shake lovers: the STRAW. Short for Suction Tube for Reverse Axial Withdrawal, the STRAW was designed by real engineers at the aerospace and robotics engineering firms JACE and NK Labs—specifically with the Shamrock Shake in mind. What sets the device apart from conventional straws is the sharp bend in its shape and the three, eye-shaped holes in addition to the opening at the bottom end. The extra holes are positioned in a way that allows drinkers to take a sip of a new layered version of the frosty treat that’s equal parts top mint layer and bottom chocolate layer.